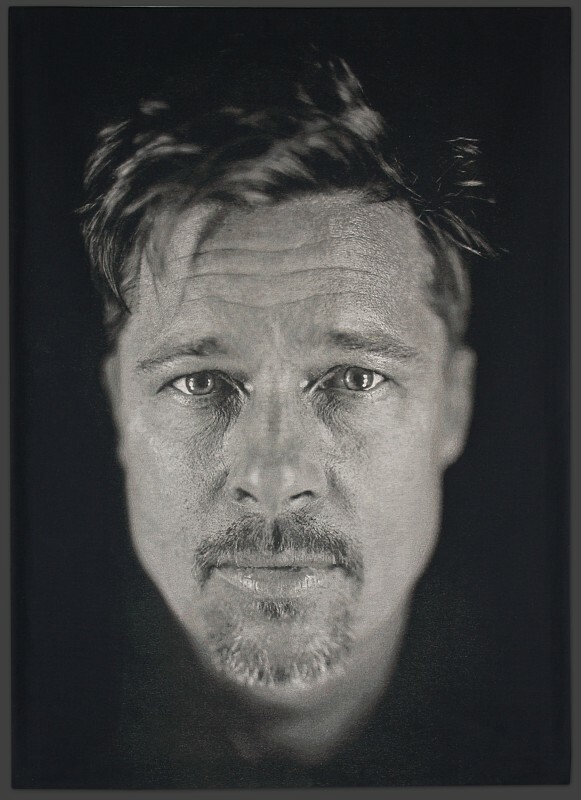 Chuck Close’s Brad, depicting actor Brad Pitt, is a tapestry edition of 10 published by Magnolia Editions. For almost four decades, Chuck Close has created portraits from tonal grids of fingerprints, pointillist dots, brushstrokes, paper pulp and countless other media. It was only natural that the artist’s ambitions led him to tapestry, a classical and difficult medium posessing Close’s signature tension between abstracted units (woven thread combinations) and a legible, unified surface. Close’s signature method can be considered, for discussion’s sake, as follows: a subject is photographed; the photographic image is then translated into a large oil painting on canvas via a systematic, grid-based rubric. In many of his recent paintings, each cell in the grid is initially filled with a particular color, arbitrarily chosen and intentionally distant from the color desired. As the painting progresses, a series of other colors are overlaid or concentrically inserted into the cell, creating combinations which alter the way we perceive its overall color. “Optical blending” is the name for the phenomenon by which the human eye amalgamates neighboring colors into a single hue. A viewer’s encounter with any work by Close hinges on this process, for the eye works first on a micro level to combine the colors in each cell into a single bit of color information, and then on a macro level, to add up the mosaic of individual bits, as the abstraction of the grid coalesces into an image of a human face. The rigor and mathematical precision of the grid has prompted numerous writers to label Close’s process as “scientific.” The flip side of this is the unexpected musicality afforded by the grid. Its repetitions create a precise and regular rhythm while the variations in color represent a series of literally chromatic modulations. “I’m working with the color equivalent of a musical chord, a kind of color chord,” says Close of his compositions. The layered, concentric colors within each cell are reminiscent of the stacked thirds and flatted fifths of a chord progression, their passages of dissonance and tension ultimately resolved in a sophisticated harmonic balance. The translation that is so fundamental to Close’s process – the filtration of a given subject, first through a photographic lens and then through the grid system – necessarily involves an alchemical transition from one state to another. His tapestry portraits are among the most extreme examples of this change of states. Here, Close takes a photographic image and transforms it into a woven textile, a grid composed of optically blended warp and weft threads. The images in the tapestries begin as daguerreotype plates: at 8.5 x 6.5 inches, the daguerreotypes must be seen up close to be seen at all. Their silvery faces are among the most reflective, glossiest surfaces you can find and are almost difficult to see clearly, since while you scan the image you cannot help but see your own face mirrored back at you. The tapestries, by contrast, are nearly ten feet tall and completely matte. A daguerreotype plate is fragile and easily fingerprinted; the tapestries are durable textiles that practically beg to be touched. What’s more, they are the opposite of reflective – they absorb; in this case, not light, but sound and heat. Where Close’s prints and paintings have depicted family members, art dealers and other acquaintances, his daguerreotypes (and consequently tapestries) have been devoted almost exclusively to other artists. Of particular note is the preponderance of what might be called ‘professional subjects,’ or more simply, performers. Cindy Sherman, Kate Moss, Lyle Ashton-Harris, Rene Fleming, Brad Pitt – these are all actors of one stripe or another, figures who transform on stage or in front of a camera, who have made brilliant careers out of putting themselves on display. When they enter a room, it is as if their sheer presence palpably expands to fill the space; the impact of a ten-foot-tall portrait, then, acts as a natural amplification of this larger-than-life quality. Encountering Close’s tapestries, it is hard not to be convinced that each of these individuals possesses some kind of inner flame, some mysterious internal magnet that exudes charisma. The areas of rich detail which pop out of passages of soft focus, an effect native to the daguerreotype, contribute to a dramatic narrative, the story of light and clarity emerging from obscurity. It is as if Close has embedded in the portraits a representation of the mechanism of star power itself: as the subjects’ features emerge from the darkness, we are both literally and figuratively seeing them shine.